Welcome June! The month that ushers in long hot summer days. The month of vacations and projects completed. 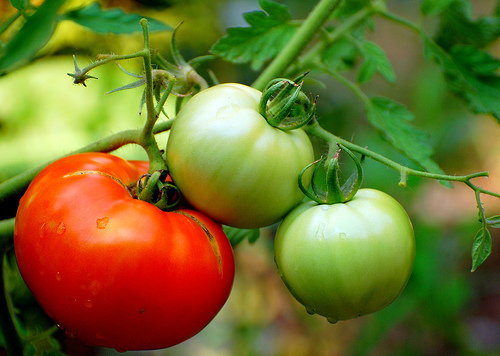 The month that so many colorful tasty things are ready for harvest – tomatoes among them. Did you know that tomatoes are actually berries? Their edible seeds and pulpy insides make them so. First take your chosen tomato and cut it in half horizontally (across its equator.) With a spoon, scoop out the seeds into a clean container. Add a couple of tablespoons of water to the seeds and cover the container with a piece of plastic wrap. Poke holes in the wrap to allow for air, which helps foster fermentation. Place the container with the tomato seeds in a warm location, such as a sunny windowsill. Each night, remove the plastic wrap and stir the seeds and water mixture and then replace the plastic wrap. In about two to three days, the seeds will begin to ferment. A “gooey” surface will appear on the top of the mixture. Take a spoon and carefully remove this “gooey surface.” Place the tomato seeds in a sieve and rinse well with water. Place the clean seeds on wax paper or a coffee filter and spread them in a single layer. Let seeds dry thoroughly. The drying process can take up to a week or more. Once dry, the tomato seeds can be stored in an envelope or other paper packet. I’m going to try this soon enough, and will be sure to share how it goes. If any of you out there try it, please do the same! Thank you Tomato.org for this know how.